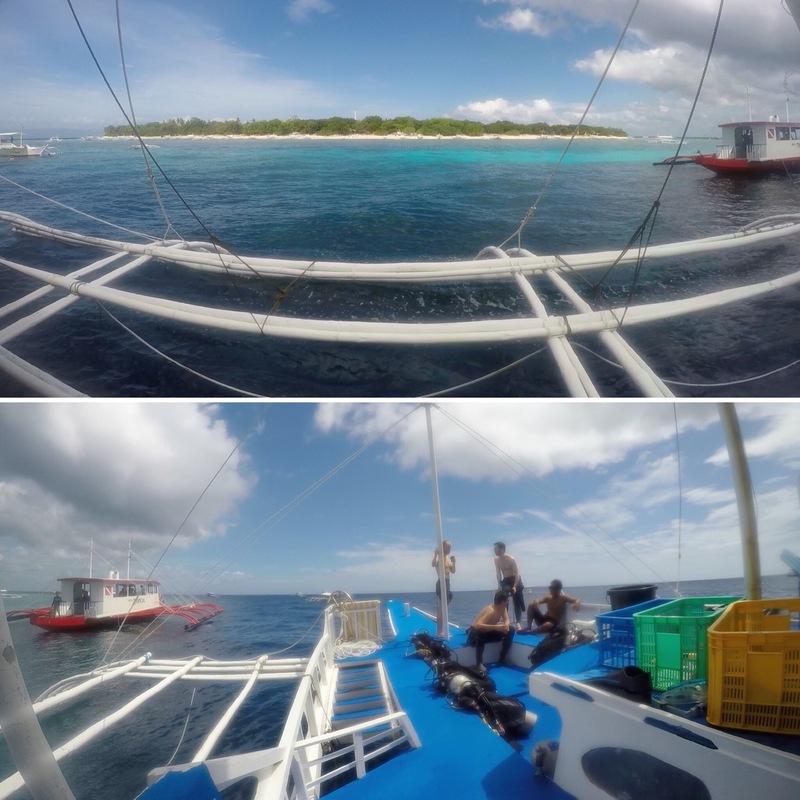 After a great morning swimming with whale sharks, we left Oslob and got on a boat to the island of Bohol Island. 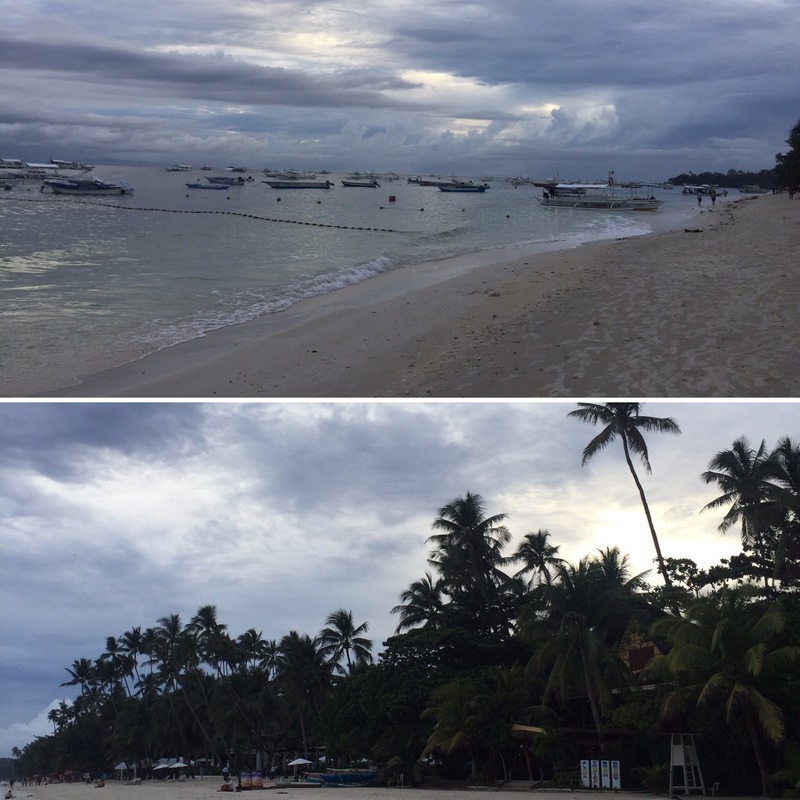 It had been raining all morning so the boat that the hostel had arranged to take us the two hour journey to Bohol was originally cancelled. After an hour the rain was dying off and we were about to get a car and then a ferry from another port when the hostel were told the original boat would go! 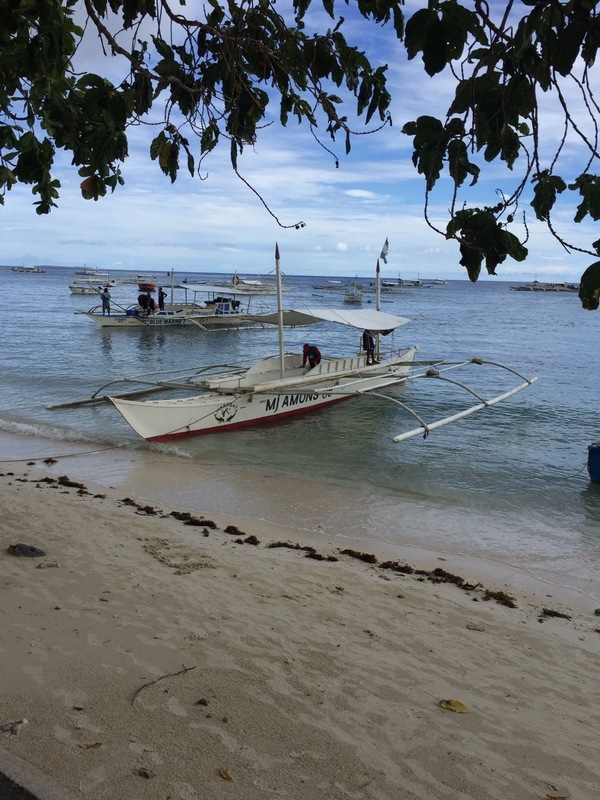 We were taken to the port which actually turned out to be a bunch of boats off the shore of a beach. We had to carry our big, heavy bags into the sea and get onto a catamaran boat. Thankfully our bags were put inside of the boat to keep dry and there was a tarp pulled over the boat to create a roof so we weren’t going to get that wet as it was still slightly raining. This definitely hadn’t been what we were expecting to be on and, I’ll be honest, we were both a little apprehensive. As well as myself and Niall there were also two Norwegians on the boat with us called Alex and Vendelin (both lovely and also slightly nervous for the boat ride ahead). *To be honest this was the most likely outcome as you always have to remember that the drivers of the boat actually want to get home too and it’s not exactly good business for them if things happened to their passengers but it’s still going to enter your head when we know what can happen in the Philippines out at sea. We were completely fine and didn’t need to have worried but we probably wouldn’t have chosen that option as our mode of transport had we know what it would involve! Our home for our time in Bohol was a place called Alona Beach Hammocks. 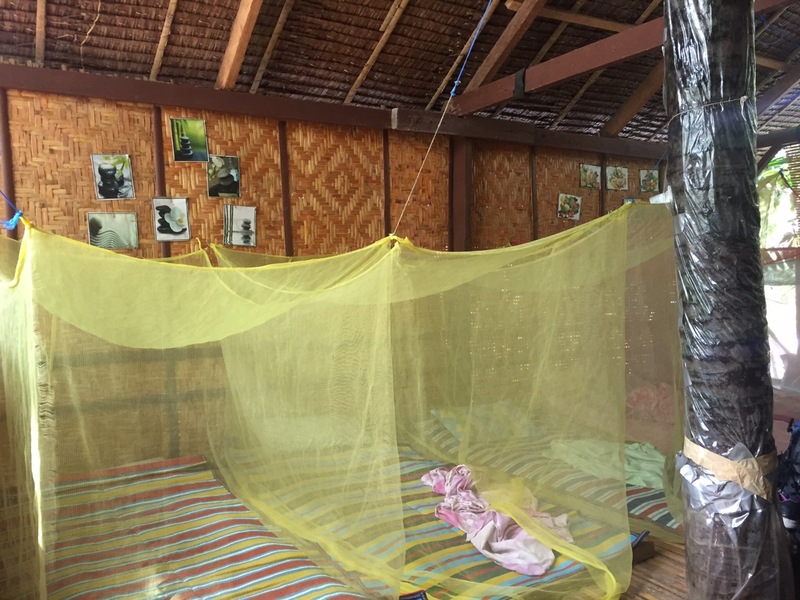 This was kind of like a giant tree house made of bamboo with padded mats for our beds and surrounded by mosquito nets (not actually as uncomfortable as it sounds!). 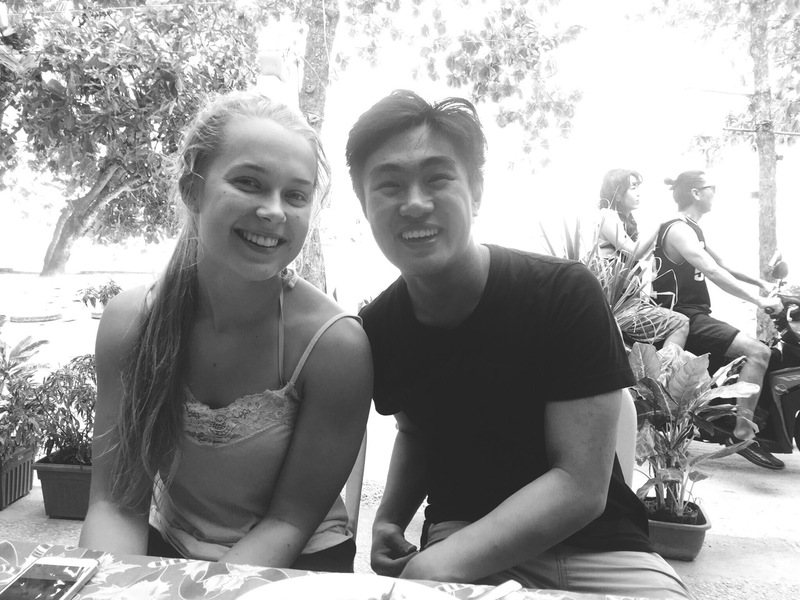 We had chosen to stay here as the reviews had been really good and so knew that this was what the accommodation was like before we arrived – I imagine you’d get a shock though if you hadn’t looked into the hostel much before booking! The hostel wasn’t inside at all and the weather on Bohol is tropical with rainfall happening everyday so the biggest issue we found with this place was drying our wet clothes and stopping the rest of our things from being damp. We were only there for a few nights though and you can deal with anything for that length of time, plus, the people at the hostel more than made up for any inconvenience in comfort! 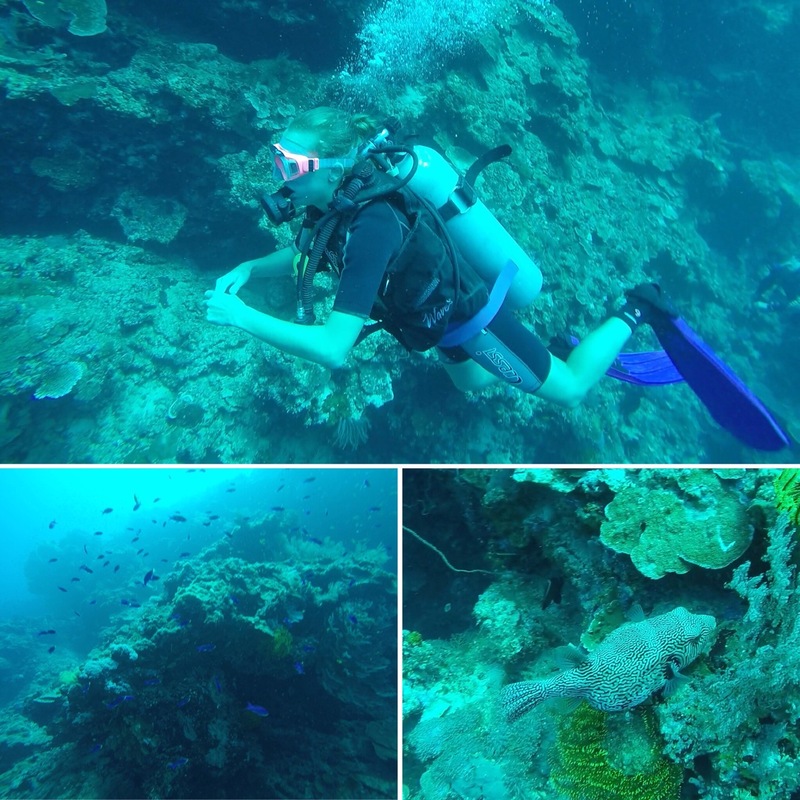 We were on a relatively big boat with around three other divers and then around another five or six snorkelers. 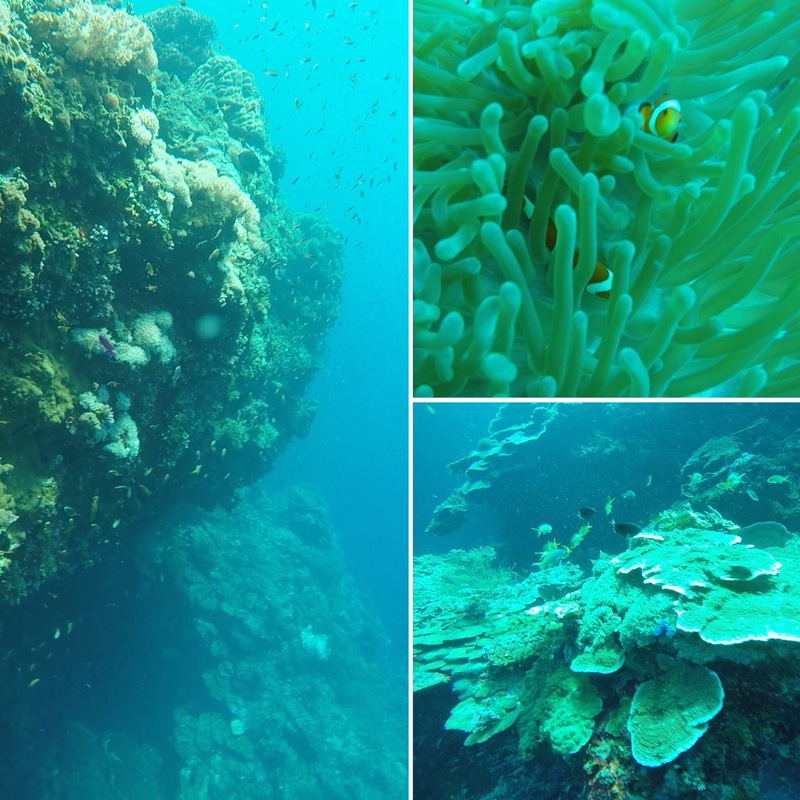 The first dive site we stopped at was called Diver’s Heaven. Before we were even off the boat we saw some turtles which was exciting and the dive didn’t disappoint, showing us great coral and loads of fish such as clown fish and a range of starfish. We also saw a lot more turtles which was nice as we had only ever seen them whilst snorkelling before. All diving boat trips seems to follow a standard procedure. You will be fitted with all of your gear (BCD, wetsuit, fins and mask etc.) and then you’ll probably have a bit of waiting around whilst everything gets loaded onto the boat. The boat will have a bunch of air tanks along the edges (or at the diving section at the back depending on the size and sophistication of the boat) and then you’re off. 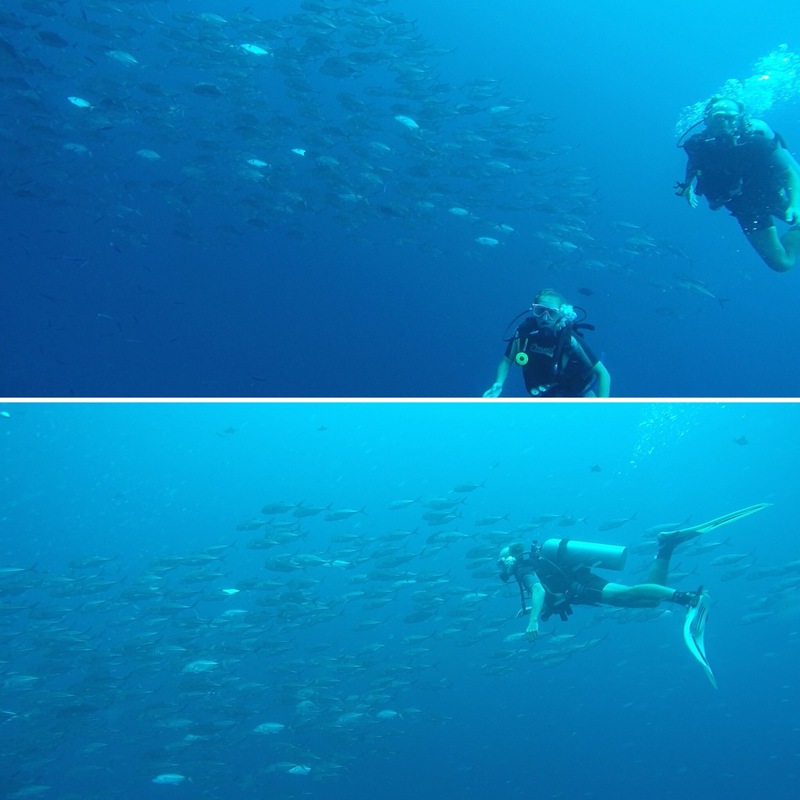 You’ll likely get some food or snacks along the way and will get a dive briefing of where you’re going to be diving and information such as a rough route or intended diving depth before you go in the water. 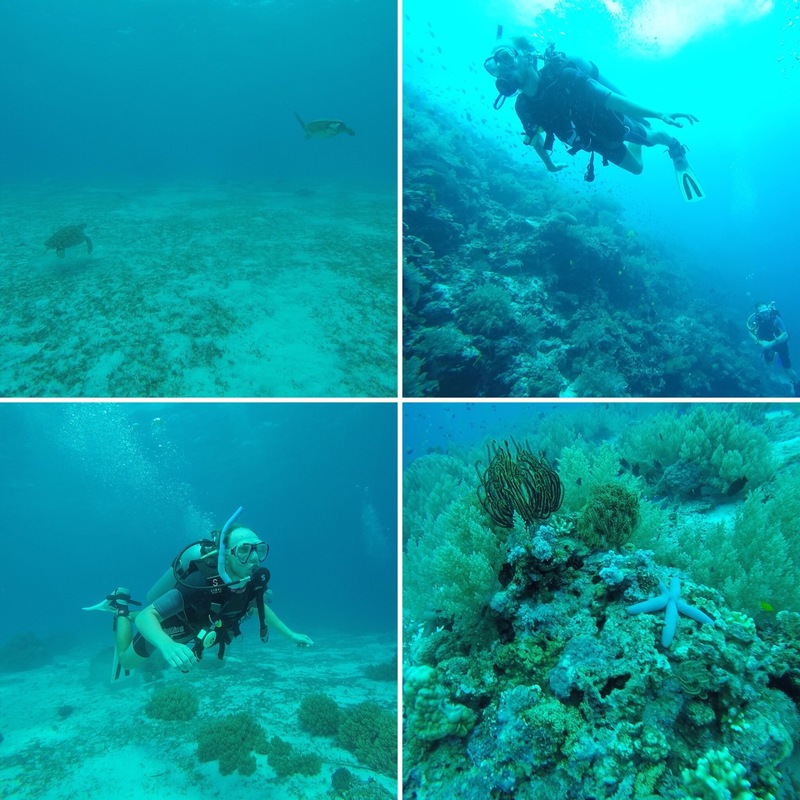 It’s quite a chilled day and we always have a lot of fun regardless of the dive company we are with so we mainly focus on price, any extras and whether we think the company seems legit when we’re choosing who to go with. Our second dive was at a site called Rudy’s Rock after a diver called Rudy who discovered the place. 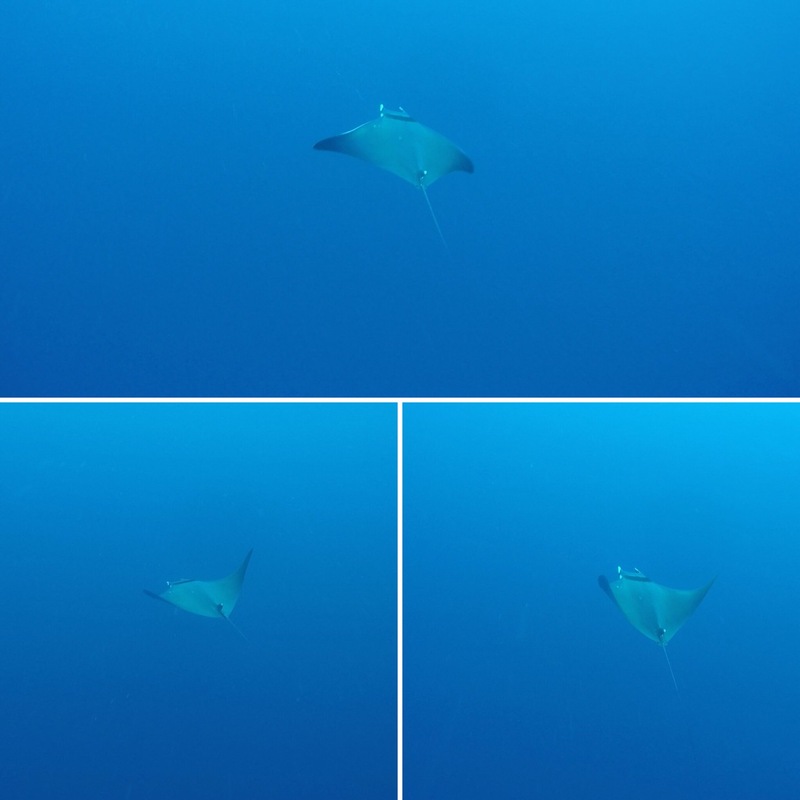 On this dive we were lucky enough to see a Devil Ray which is kind of like a small Manta Ray. 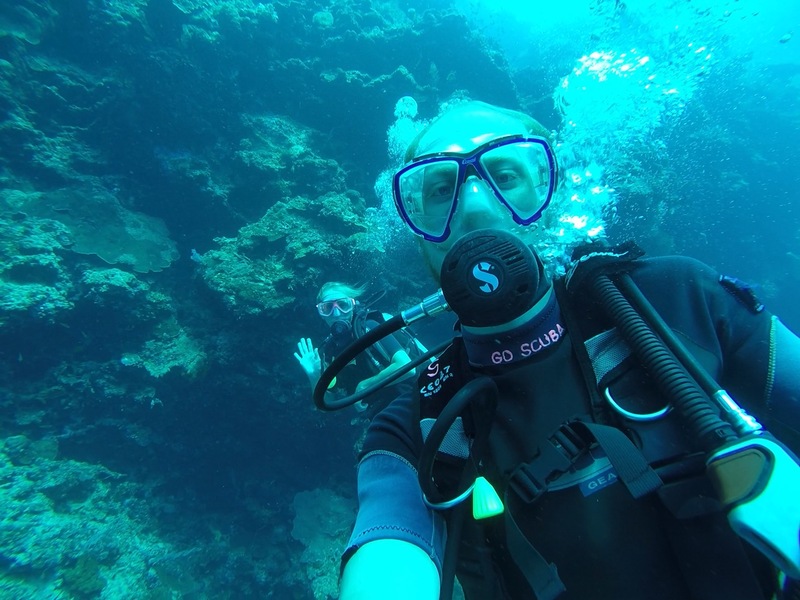 Our dive master (he guides you on your dives) was really excited about it and Niall used up most of his air supply swimming after the Devil Ray! 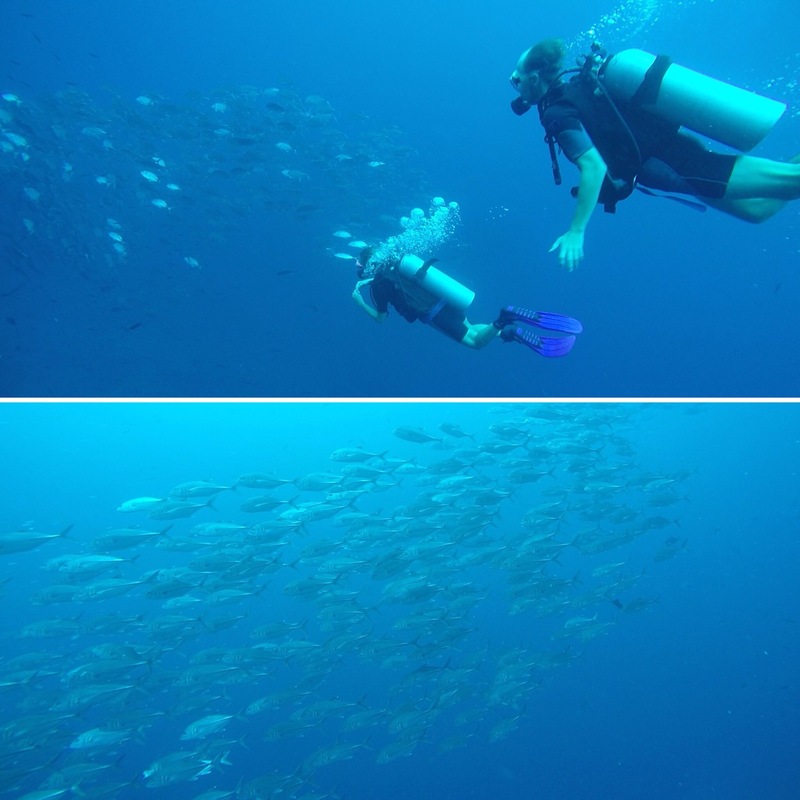 We also saw an enormous school of jack fish which was great to see due to its sheer size and it all moving in unison to swim around us. 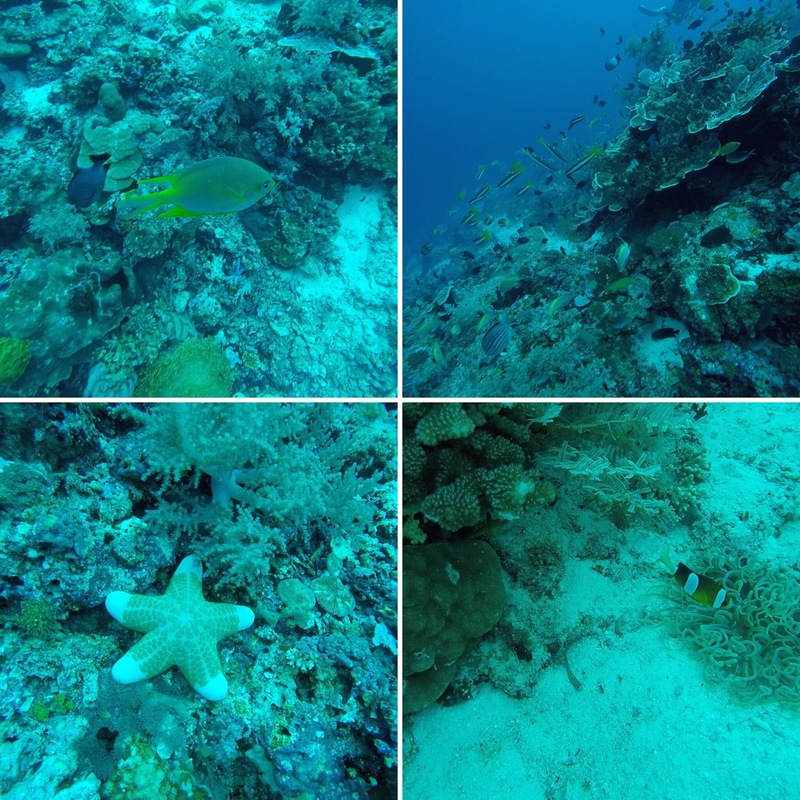 This was another great dive and we were really happy with the day we had had and what we had been able to see. We had a chilled evening after our dive and just got some food that was recommended by one of the staff at our hostel. 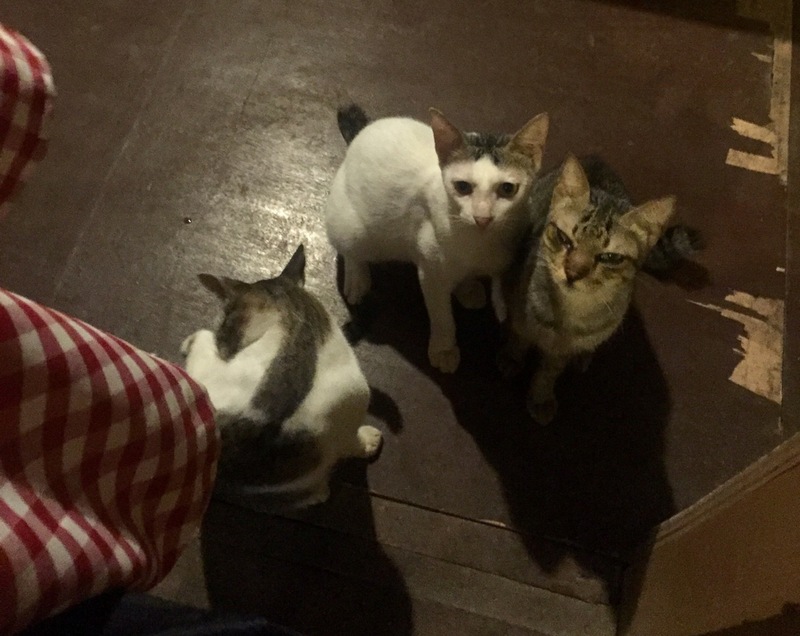 As the restaurant was just an open space with a roof there were a number of cats that would come in and try and get you to give them your food – Niall had three trying to get some food off him at one point! The next day we planned on hiring a scooter and having a look around the island. Apart from going diving, a lot of people come to Bohol to see a tiny primate called a Tarsier which is one of the smallest in the world and to see the Chocolate Hills which get their name for looking like little chocolate drops or Hershey’s Kiss chocolates. As luck would have it, Salvador who worked at the hostel was taking a few other people who were staying at the hostel on a little tour of the island and so we went too. This proved to be invaluable as we probably would have spent the majority of the day lost and certainly wouldn’t have seen as much as Salvador was able to show us! Our first stop was to the Tarsier Sanctuary. They are in the wild on the island but it would be almost impossible for you to find one on your own as they’re so small but live in a huge area so the best thing to do is go to the sanctuary and see them there. Tarsiers are such cute little creatures and have enormous eyes which makes their vision infinitely better than humans. They’re nocturnal so we only saw sleeping or resting tarsier’s but they can cover massive distances during the night. 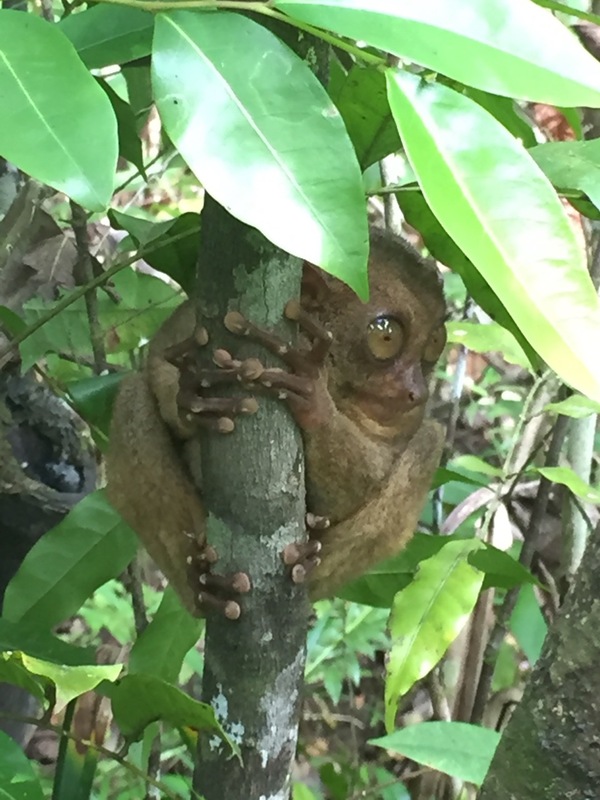 You get shown around the Sanctuary so that you can have the tarsier’s pointed out to you, this is really needed as they often hide under leaves and, as they’re so small, you’d miss them if you didn’t know they were there! 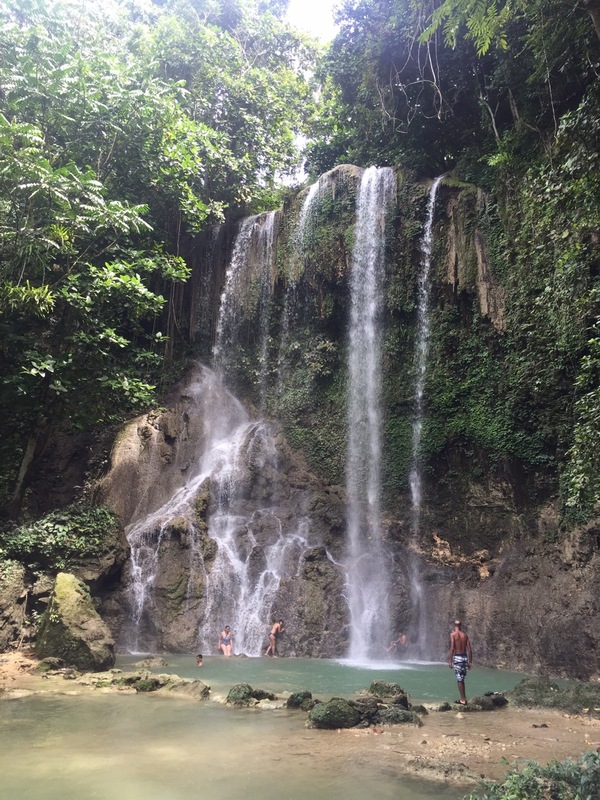 Our next stop was to Kawasan Falls which was really pretty. There were a few other people here but it was by no means busy. We wouldn’t have found this place on our own as I think we’d have ended up turning back and thinking we had gone the wrong way as you had to drive down a really small mud path to get there. We have been to a waterfall with the same name before so I asked what it meant and they said it meant ‘overflow’. We went swimming here and the water was refreshing if not slightly cold as it didn’t have the sun shining directly on it, the water under the falls was also really powerful. After lunch we then headed to Camugao Falls (pronounced cam-oo-gow) and this was probably our favourite spot of the day as we were the only ones there! The water was a turquoise-green and I found it warmer than the last place although Niall found it colder. It was so lovely us being the only ones there! From left to right: Niall, me, Sam (Italy), Esther (Spain), Yanna (Czech Republic) and Salvador (The Philippines – he works at the hostel). 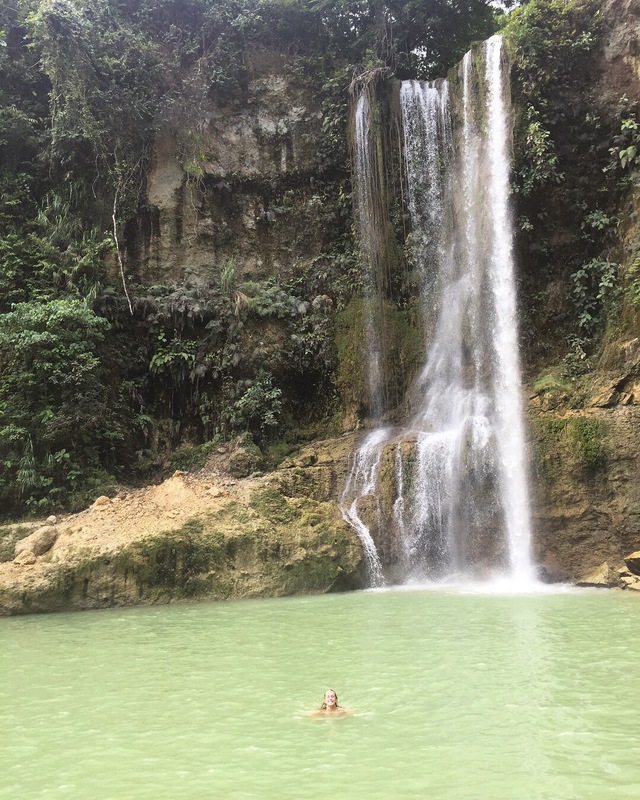 After swimming in the waterfalls we went to the Chocolate Hills. These were vast coned hills that stretched for miles. They were given the name due to the them looking like chocolate drops and they did have the shape but they were bright green when we visited and not the muddy brown like in the photos due to the time of year we went. I thought it was really nice to see and they were very uniform in their shape which I hadn’t expected. 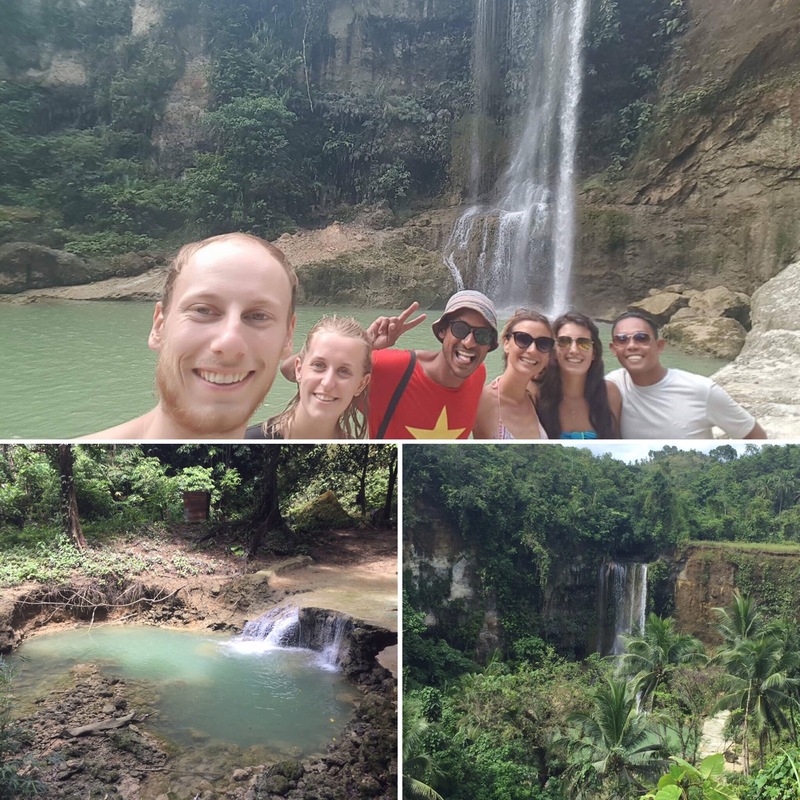 After sheltering from some very heavy rainfall, we headed to our final stop of the day which was the Pangas Falls. These falls were in a semi-circle that ran the full width of the river. The water was so strong here that that they made you wear a lifejacket if you wanted to swim here – it was getting later in the day and so we didn’t bother swimming. There were loads of local kids by this falls which was so cute as they all ran over to us for high fives and to say hello. We even got given some papaya from their parents who ran the store next to the entrance of the falls. This wasn’t the prettiest of falls as they had built a massive viewing platform/hut which was in the middle of the falls meaning that you didn’t have an unobstructed view of the place. We all agreed that it would have been nicer had they not built it. After a couple of hours drive back to the hostel resulting in numb bums and us feeling pretty tired we were greeted with the smell of cooking and the promise of a feast! The people at the hostel were hosting a Boodle Feast which is where they make loads of food and put everything on big banana leaves on the table and then everyone just digs in and eats as much as they can with their hands. The food was really good and we had rice, vegetables, squid, fish, chicken and pork as well as really great pineapple and watermelon. We were all stuffed and it was a lot of fun standig around the table, eating with your hands and ‘fighting’ for the food! The hostel isn’t massive and so all the guests were involved in the boodle feast that evening. It was really nice to all be getting to know each other and then everyone also went out to a bar afterwards as it was ladies night and so you could get a cocktail for 35 pesos which is around 50p! We spent the rest of our night there all together drinking, dancing and some people also sang (Filipinos love to sing – even when it’s not officially a karaoke place they’ll still get up and join in with the band!) It was a great end to a really good day and we were really thankful that we had been lucky enough with our timing to get in on an unofficial tour of the island! 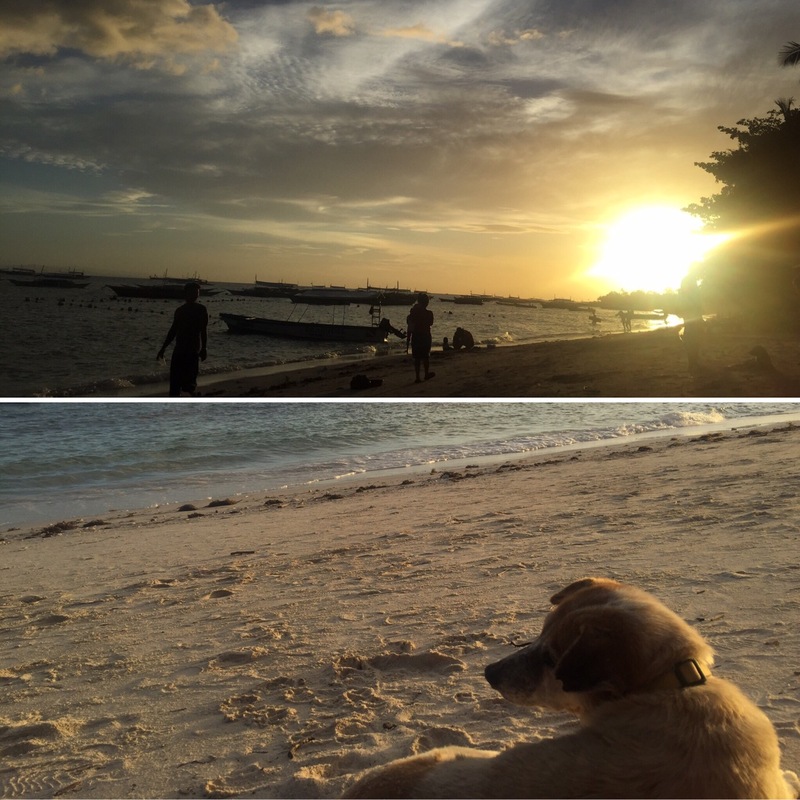 Bohol is a really fun island with a lot to offer. It rains at least some point every day but often not for very long so it doesn’t really impact on doing anything on the island. The diving was great and we had loads of fun biking around the island (although having a local guide was definitely an advantage there). The hospitality we received from our hostel was also what made our time on the island so good and it’s definitely not a place we’ll forget any time soon.